One of the things that I had never really tried prior to starting this blog (today is the one year anniversary of its launch) is Greek yogurt and now this far down the line, I've had more Greek yogurt than I would care to admit. 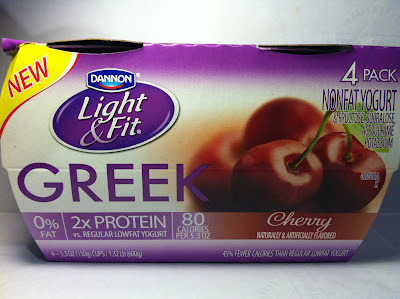 Within the past few months, Dannon introduced a Greek yogurt component to their oft-reviewed Light & Fit product line and today is the first review of that product line with this review of the Dannon Light & Fit Cherry Greek Yogurt. They don't sell this in single servings in my stores, so I picked up a four pack of these for $3.99 at my local Meijer. Each container is 5.3 ounces and a surprisingly low (for Greek yogurt) 80 calories with twelve grams of protein. I've got to admit...I'm pleasantly surprised by the fact that Dannon continued its Light & Fit motif on this by making it eighty calories just like they do with their regular line, so that's impressive. These Greek yogurt cups are designed with the fruit on the bottom, so naturally the cherry mix in this cup (i.e. the flavor) is to be found at the bottom of the yogurt cup and required me to do a little digging. As for the Greek yogurt itself, it was relatively thick and had a mild tangy smell. Once I got to the cherry mix, I found some small cherry pieces, but nothing overly large or impressive. Even with that lack of size in the cherry bits, I was very impressed and very excited once I smelled the cherries because they smelled wonderful. Sweet smelling and very "cherry-like," they were everything you could hope a pre-packed cherry product to be like and I was anxious to dig in. 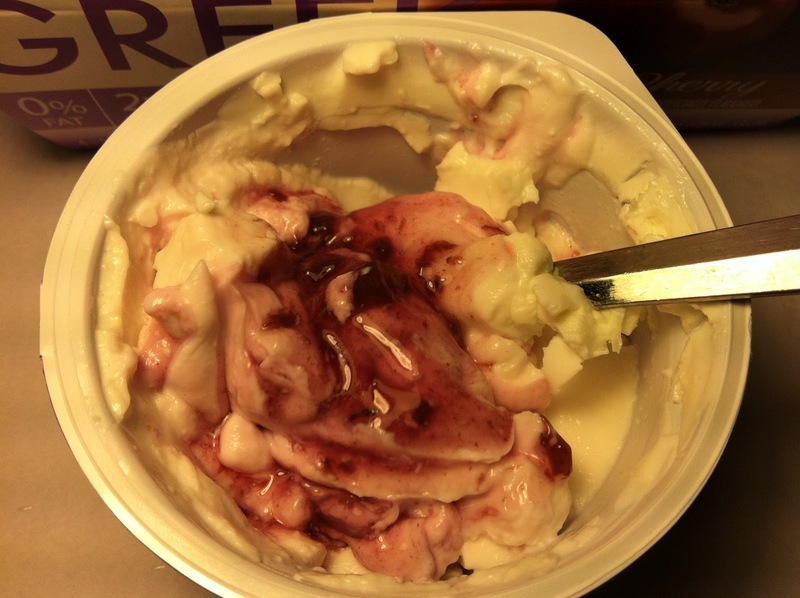 Before I dove into the cherries, I first sampled the yogurt itself and the taste was very similar to the smell in that you definitely realized you were eating Greek yogurt, but the taste was mild and pleasing and not overwhelmingly tangy like some Greek yogurt products can be. That was a delight and after being pleased by that aspect, it was time to dive into the cherries and I've got to say that my pleasure continued in a big way. The cherry mix was absolutely wonderful and flavorful, almost like a cherry pie filling in that it was sweet, but not tangy. When you mixed this in with the yogurt, it was almost like you were eating a creamy cherry pie and frankly, who doesn't like something that tastes like pie? I know I'm not one of those people, so I was exceptionally happy with each spoonful that I ate. Buy It or Fly By It? I just realized that its fitting that I reviewed a cherry product on the birthday of the site because as a child, I loved cherries so much that I requested a cherry birthday cake. Unlike that birthday cake, which was awful, this Dannon Light & Fit Greek yogurt was wonderful and it gets a strong BUY IT rating. Pick this one up yourself and I think you'll find that you will be just as pleased by this as I was and now I can't wait to try out some of the other flavors. Welcome to the Greek yogurt show, Dannon. It's nice to see you've joined the ever expanding game. P.S. I'm not much of a birthday person in real life (I actually despise celebrating my birthday), but I'd be remiss to not at least mention the blog's big day here on the site. The gratitude list is too long to mention people and sites individually, but I'd like to thank everyone that has visited the site, commented on posts, re-tweeted posts, linked to posts, etc. I'm grateful for everything and never did I think this site would get as much of a fan base and positive response as it has gotten, especially with some of my horrible efforts. Thank you again for everything and I hope to bring more to you in the future. ive become quite the greek yogurt aficionado as well lately. havent seen these in my store yet though, will keep an eye out. Also congrats on the blog "birthday" hopefully you have many more! I like these a lot! The strawberry flavor is even better imo. Fage = twice the sugar +50% more calories. wish they would stop using sucralose and aspartame - artificial sweeteners - cause headaches. Use stevia as a substitute. Natural and not chemical. "Aspartame has three components: methanol, phenylalanine, and aspartic acid. All three of these chemicals have each been shown to either stimulate brain cells to death, severely disrupt hormone balances in the brain, or act as a dangerous nerve poison." yea this on tastes totally like chemicals - YUK!!! Yeah, it tastes like eating spoonfuls of Splenda. I enjoy it I will try the Fage I know the calories are very high but healthier wins with me as well. Same reason I dont eat a protein bar because it has less calories its not real food a healthy meal always wins. I have to say I love the light & fit Greek blends Banana cream, it is like a desert and better then eating a candy bar. It depends on why you are eating the yogurt in the first place. I love the greek dannon mouse but I can't find it anymore. Think I will switch to plain yogurt and add my own fruit! The sugar content in these "healthy" yogurts is enough to pack on the pounds! No more fake stuff for me! Get out fructose, sucralose and acesulfame ...whatever that is!!! Bye Bye! Why can't you make this stuff already blended together. I hate having to stir it up and will not buy it again until it is blended.